The following information pertains to all Krause Group, Kum & Go, Des Moines Menace, Teamwork Ranch, and Solar Transport associates. Part of the ACA legislation requires that Kum & Go L.C. to provide employees that were eligible for health care coverage in 2018 with a 1095-C tax form. The deadline for employers to provide the 2018 1095-C tax form has been extended to March 4, 2019. These tax forms will be mailed separately to your home address by March 4, 2019. Remember, although you are not required to file the 1095-C tax form with your income tax return, it is important that you do not discard this document. Only one 1095-C tax form is provided for all individuals covered by your health plan, and it should be kept in your records with any other important tax documents. Q: What is Form 1095-C? A: Form 1095-C contains detailed information about the healthcare coverage provided by your employer. If you were enrolled in healthcare coverage from your employer, worked an average of 30 or more hours per week, or were considered a full-time employee at any point in 2018, then you should receive a 1095-C. Taxpayers do not need to wait to receive Form 1905-C before filing their 2018 tax returns; however, you should keep this document with your tax records. The information you report from the form will be used to determine whether you will pay a penalty for failing to have healthcare coverage as required by the Patient Protection and Affordable Care Act, also called Obamacare. Think of the form as your “proof of insurance” for the IRS. Q: How will I receive Form 1095-C? A: 2018 1095-C documents will be mailed to active and former employees who were full-time (worked an average of 30 or more hours per week) or were enrolled in the company’s health insurance plan in 2018 by March 4, 2019 to the last updated address in our system. Contact the Grow People Department at 515-457-6221, to verify if you need to update your address. If your 1095-C has been sent back we will mail it to your updated address. Active Employees: Obtain an electronic copy of your 1095-C, immediately, through Workday. Terminated Employees: After March 4, 2019, you may request a copy of the 1095-C form. Payroll will print 1095-C’s if requested, for active or terminated associates; however, you will need to complete a 1095-C Request Form. Once the form is complete and received by the payroll department, a replacement 1095-C will be sent to you as you specified on the form. Once the form is received please allow for 7-10 days for processing. Q: Can I obtain my Form 1095-C through Workday? A: Active employees can take the following steps to obtain their 1095-C electronically. Q: Who receives a Form 1095-C? A: Employers with 50 or more full-time employees are required to send a 1095-C to any employee who was full-time (worked an average of 30 or more hours per week) or who were enrolled in their health insurance plan in 2018. Q: Why did I get a Form 1095-C? 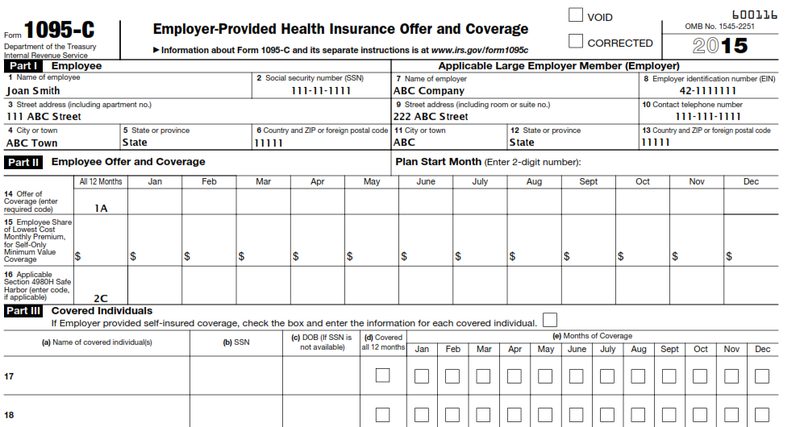 A: If you were full-time (worked an average of 30 or more hours per week) or were enrolled in health insurance through your employer at any time during 2018, you should receive a 1095-C.
Q: Why did I get more than one Form 1095-C? A: If you worked at more than one company or franchise, you may receive a 1095-C from each company/employer. Q: What should I do with my Form 1095-C? A: When you receive your 1095-C, keep it for your records. You will need it to complete your tax return. Q: Do I need my Form 1095-C and my W-2 to file my taxes? A: No, taxpayers may complete their 2018 tax returns without Form 1095-C; however, it is recommended you keep this form with your 2018 tax records. Q: When will I get my Form 1095-C? A: The 1095-C will be mailed to the last updated address in our system by March 4, 2019. If you believe you should have received a 1095-C but did not, please contact Grow People Service Delivery at 515-457-6221. Q: Will I be fined if I did not receive a Form 1095-C? A: If you don’t have qualifying health insurance, in some cases you can claim a healthcare coverage exemption. You can use the IRS Health Coverage Exemptions Form 8965 to find out if you qualify. Please visit www.irs.gov or www.healthcare.gov to learn more. Q: Why didn’t I get a Form 1095-C? A: If you were not full-time (worked an average of 30 or more hours per week) and were not enrolled in health care coverage through your employer at any time during 2018, you should not receive a 1095-C. You may also not receive a 1095-C if you were not the primary insured. Q: What information is on the Form 1095-C? Part 3 reports information about the individuals (including dependents) covered under your self-insured plan. Q: How will the form 1095-C impact my taxes? A: If you do not have healthcare coverage and do not qualify for an exemption, you may be subject to a fine when you file for your 2018 tax return. Or, if there’s a discrepancy in the information that you and your employer report to the IRS about the healthcare coverage offered to you, your tax return may be delayed. Q: What is the difference between a 1095-A, 1095-B and 1095-C? A: The forms are very similar. The main difference is who sends the form to you. The entity that provides you with health insurance will be responsible for sending a Form 1095. You will receive a 1095-C if coverage was provided by your employer. A: If you have additional questions about your 1095-C, please visit www.irs.gov, www.healthcare.gov or www.mytaxform.com to learn more.